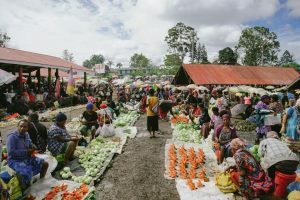 Papua New Guinea is the kind of destination travelers dream of, but for many, it seems like a difficult and expensive destination to travel to. If you do not do your research this can definitely be true. 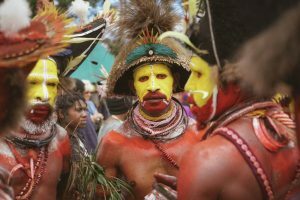 With almost non-existent tourism and a major lack of infrastructure, traveling Papua New Guinea can be a very expensive ordeal. Luckily, the island nation is opening up to more budget travelers who brave to come here. Those who do venture here can expect to be met with exotic tribes, lush rainforests, empty beaches, and incredibly hospitable people. 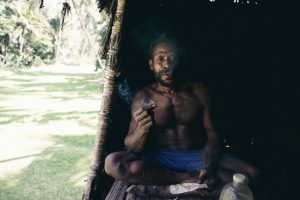 After traveling Papua New Guinea for over a month I’ve created this budget guide to traveling Papua New Guinea. Get here before the crowds do, because Papua is a traveler’s paradise! 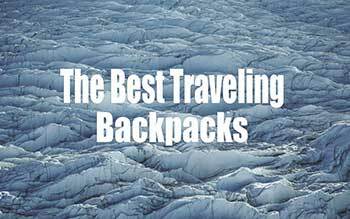 as they are reviewed quite favorably and have great prices. Secondly, if you book far in advance with Papua New Guineas two national airlines, Air Niugini and PNG Air you can get seat deals. Last minute tickets in PNG can also be heavily discounted, but you run the risk of not getting a flight. PNG Air tends to give better discounts than Air Niugini. International flights into Papua New Guinea are always very expensive. 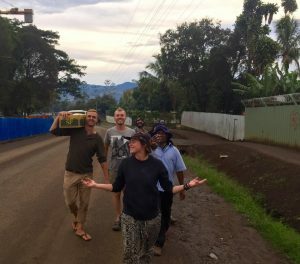 You can follow my Uncharted Backpacker Guide to Cheap Flights, but most likely you will pay a lot, and have to get a second flight as the only international airport is in Port Moresby which has no roads to anywhere else in the nation. 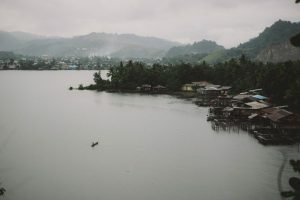 My biggest tip to get to Papua New Guinea on the Cheap is to fly to Jayapura in Indonesia’s Irian Jaya. 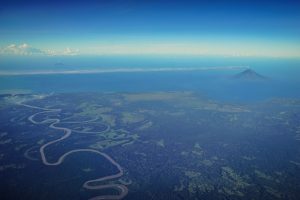 This is the western side of the Papua Island, from here you can easily cross into Vanimo and then take a cheap flight or boat onward into Papua New Guinea. It’s a rougher route, but hey that’s why we travel to Papua New Guinea isn’t it? 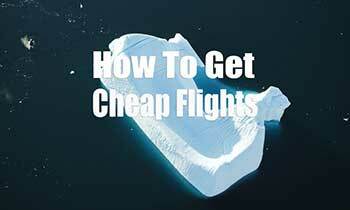 Doing this will save you majorly on the international flight and the flight from Port Moresby. 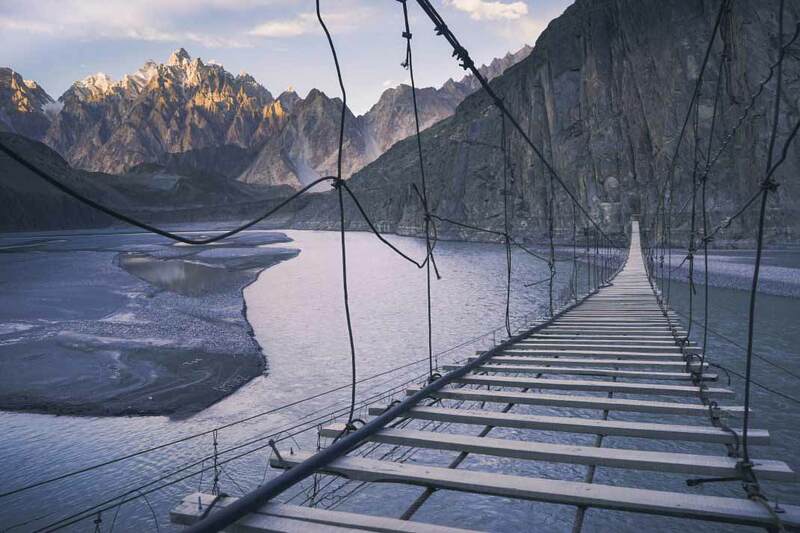 The crossing is also a synch. If you do not have a visa already just come to the embassy in Jayapura with two passport photographs and to be safe a 100 USD. The process takes about three days in which you can explore Jayapura’s beautiful coastline. Other than flying, there is very little information on public transport in Papua New Guinea. This is because PNG has no government-run buses or transport companies. Instead, you have make-shift bus stations in every town where, if you own any form of transport, you can become the public transit. From the larger centers, there are scheduled buses for example from Goroka to Lae. There are never really any scheduled times, but show up in the morning and you will most likely get on something. Wait times can be very frustrating, and prices are not listed so make sure you shop around. 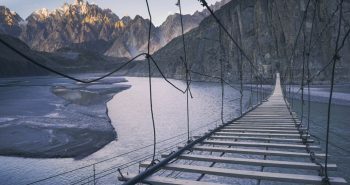 The quality of the transport also varies, and this comes with how long the journey will be. Some buses are barely roadworthy, for your safety you should defiantly check them out beforehand. PMV or Personal Motor Vehicle is the main form of transport in Papua. They range from a beat-up old bus to a newish 4×4. The better quality the vehicle, the higher the price. Locals tend to cram as many people possible into the old ramshackle buses that blast black smoke from the back. If possible avoid these buses, mainly for your sanity. 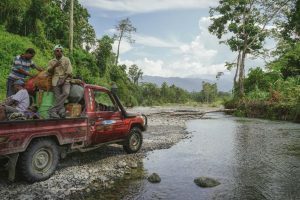 Many journeys on PMV can be very delightful in Papua New Guinea. You will meet plenty of locals this way, many of whom will offer you accommodation at their house for a very cheap price, sometimes even free! To find the PMV ask anyone in town. Towns in PNG are not big so the location can change. Once you know where just show up early in the morning and get on the best valued PMV you can find! 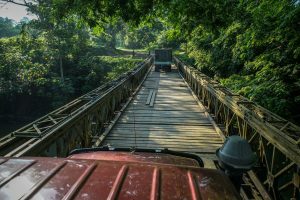 Six hours piled in the back of a truck through jungle and rivers! 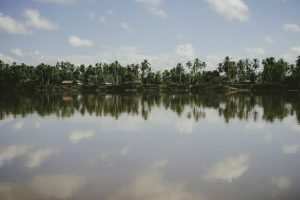 When it comes to boat travel in PNG they tend to be slower than the PMV, but in many regions like the Sepik for example, boat travel is the only form of transportation. Another example is getting from Vanimo the Indonesian Border to Wewak requires a mix of PMV and Boat. Boats can be hazardous so its best to check them out before accepting any journey. The smaller banana boats are crammed pack full of people and supplies and go very slow. If you get lucky some of the fishermen will be offering transport, their prices are much higher, but they go very fast and are much more skilled drivers. This option I would not recommend as Papua New Guinea does have some security issues. 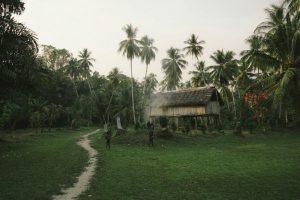 It’s not uncommon here for banditry, but travel in Papua New Guinea is unique and you are not always left with many options. If you do have to hitchhike don’t expect the ride to be free. Many locals hitch, but always pay, and as a foreigner, you will most definitely be asked for money. Agree to a price beforehand, and if it seems sketchy, back out of it! This was an exhilarating experience for me. 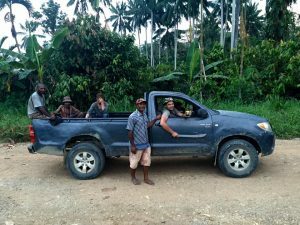 For about 50 USD per day, I rented a truck and explored the entire Upper Sepik region around Maprik. The roads were quite rough, however, and if you break down there is no help for miles. Ask at the guest houses and hotels about renting a vehicle as there isn’t much for companies outside Port Moresby that rent cars. This can be the biggest drawback to the budget travel in PNG. Papua New Guinea does have hotels, but they are VERY expensive. Most starting at 150 USD per night for a single. Luckily there are more and more options popping up all the time. 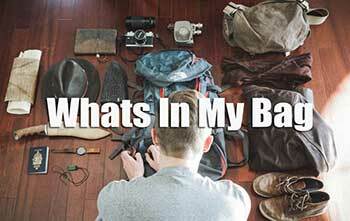 Many locals have taken advantage of this new wave of budget travelers as well by opening up their homes to guests. For the most part, homestays are not listed anywhere. If you are lucky the owners will meet you at the bus stop, but most likely you will have to ask around. 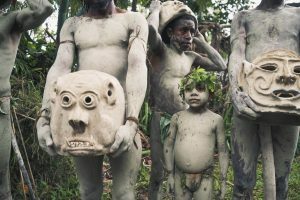 Like most small communities, in Papua New Guinea, everyone knows everyone, so this is not as hard as you think. When staying with locals keep in mind that the quality of accommodation is not always great. Sometimes you will just get a blanket on the floor. Be sure to bring small gifts as well, the kids love them! This is where I stayed most of my trip while in Papua New Guinea. 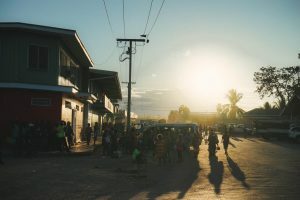 From Madang to Vanimo and the highlands, every community has a church, and more than often a church guesthouse. Unfortunately, they are not the cheapest. They range from 25 – 50 USD per night. Vanimo was the most expensive, but they often fed me at night. Most of the church guest houses gave me a shared twin room. There was never anyone else in the room, however. A few times the church guest house was simply just a hardwood floor… not comfy, but it was the cheaper option. Ok, I am a very optimistic person, but when it comes to food in Papua New Guinea get ready for a culinary disaster. Any decent food here is not cheap. So prepare yourself mentally before you get here, if you are on a budget you will be eating a lot of Maggi Noodles, and canned Tuna. Restaurants are left off the list as I didn’t find a single restaurant to be cheap. Most restaurants you will spend an easy 10 USD for a small meal. Ah yes, the Super Markets in Papua New Guinea. These cram packed facilities have plenty of mismatched overpriced food articles (often outdated) but are cheaper than restaurants in PNG. Cans of Tuna, fake brand Oreo Cookies and Maggi Noodles are affordable and stop starvation, as for nutrition, head to the Public Markets. Public Markets are your best bet for cheap food. Many of the guest houses and church guest houses provide cooking gear so picking up vegetables and meat at the Public Markets like the locals do is not only cheap but fun! 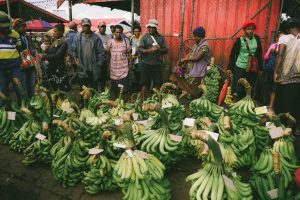 Be sure to bargain hard as when the Papuans see a foreigner they tend to raise the prices. The biggest problem with public markets is they either don’t run every day, or they only run at certain times of the day. So be sure to ask around when the best stuff is at the market. 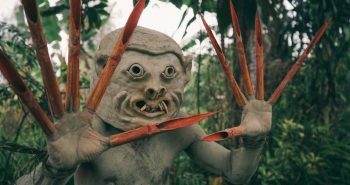 I warned you in the previous section that food in Papua New Guinea is not great. The street food is also categorized as “not great”. Majority of the hole in the wall vendors, and food shacks serve fried chicken, fried fish, and if your lucky French fries. The street vendors do serve a Papuan specialty that will most likely become your friend. This is the fluorescent red fried street sausage. I do not know whether it was me getting used to the flavors of Papua, but this little greasy sausage kept me sane. One sausage was 1 USD and kept me happy through the roughest of times. The number one PNG food tip is, eat the red street sausage! What pairs best with a strange fried red tube of meat, Papua’s ubiquitous SP beer. SP beer can be found everywhere! And I mean everywhere, even the smallest of towns usually have an SP dispensary. Locals pay about 2 USD per SP beer, this price is hard to come by as a foreigner. In restaurants, they can be up to 8 USD per SP. The best place to get SP beer is either from the sketchy alcohol dispensaries in the center of town or the random houses that sell it. For the alcohol dispensaries just approach the window during the day (not at night, for your safety), and expect to pay 2-5 USD per SP. If you want the cheapest you must ask around town. Many locals sell SP beer from their houses at rock bottom prices. You can spot these places by the heaps of SP beer bottles piled beside the house. Otherwise just ask around town. This is definitely the highlight of anyone’s trip coming to Papua New Guinea. Tribes, however, are very remote, and not the most welcoming at times. Often to visit you must first negotiate how much you will pay with the village tribe chief. Bargain hard as they start VERY high! 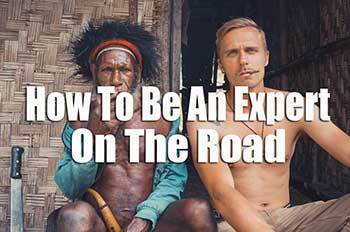 The best ways to visit a tribe on the cheap is to go with a local guide or an organized tour. Many guides will approach you in town and will offer their services. It’s best to go have an SP with them before you agree to anything. 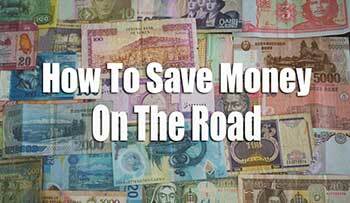 More than often they are from the specific tribe you want to visit and know all about budget travelers. 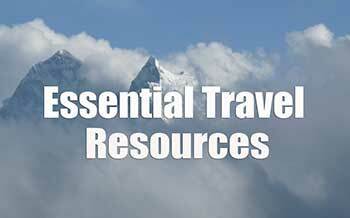 Dropping by a tour company you can often join another group which is going to cut costs or negotiate something else. Tour companies are not used to foreigners showing up and rather the norm is online booking so this gives you an advantage. 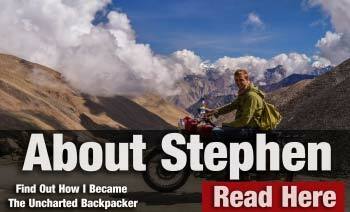 Stephen Gollan, thank you ever so for you post.Much thanks again. Can you recommend any tour operator as well ? I mostly just arranged to visit tribes an hikes through local tour operators when I arrived to each town. Thanks so much! Do you think its safe for solo female too? What Islands do you recommend? Shall i organize the visit to the tribes in port morseby ? Yes as a female its safe! Just always be smart though as there are obvious dangers here like anywhere. To visit tribes you can arrange it in the towns they reside and as for island I think New Ireland is the most incredible, but expensive as well! I’m so excited to see your comment about it being safe for solo female travellers! 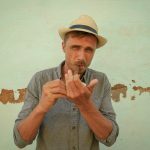 I’m looking to fly out to PNG in August and hitchhike/meander my way around for about 6 weeks. 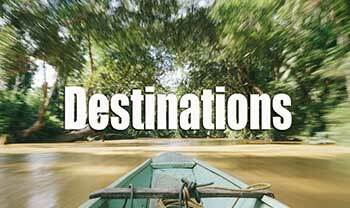 Do you think that it’s feasible to see what the country has to offer without relying too heavily on tours? I’m fine paying a cheeky bribe to get around but would much prefer to not have heaps booked in advance. Thanks!